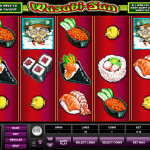 Wasabi San is a Microgaming` sushi themed video slot game. You do not have to be a fan of Japanese cuisine to enjoy this game, but if you are than the theme is definitely working in your favour. You will taste the real Wasabi with this game and not the substitute that they are serving to the restaurants. It is hot and spicy and if you know how to play your cards right it tastes really smooth in the end. The reels are placed in a bamboo frame and most of the symbols take us to a Japanese restaurant with many varieties of raw fish and rice treats. The green Japanese chef symbol plays the role of the wild and it substitutes for all the other symbols except the bonus symbols. The Yellow puffer fish and the Wasabi logo are scatters and they each activate a different bonus. 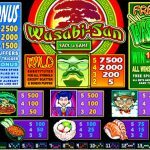 The Wasabi logo activates the free spins. You need to land 3, 4 or 5 scatter symbols to win 10 free spins with all the wins tripled. The yellow fish activates the Fish Market Bonus. To trigger the feature you need 3, 4 or 5 symbols on an active pay line. This feature will take you to a fish market where you need to pick 3 fish, each hiding a cash prize for you. 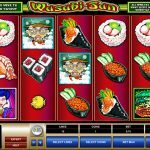 Playing Wasabi San is a real treat from the large portfolio of Microgaming games. You do not have to know each dish to play this game, you only need matching symbols on the reels. The game is a great package of bonus features, animations and great graphics that will keep you entertained for a long time. Sometimes all you need is a little change in atmosphere the next game will give that to you: Victorian Villain a 5 reel slot by MicroGaming.